The Oil tank shown here is an updated product for 2003 - 2004 Polaris 110-150 Watercraft. It offers more "roll-over" protection for map sensors; compensates for slight variances in the oil level and reduces the chances of water / oil emulsion. 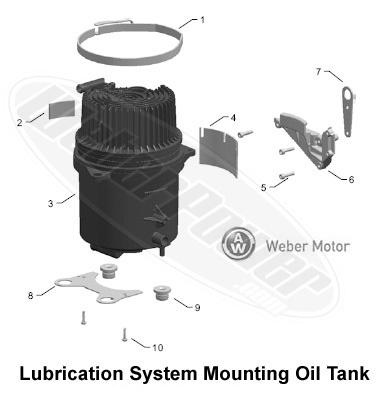 The parts shown ARE NOT interchangeable with the original oil tank. The original tank is easily identified by its metal construction. *Warning* If you have a 2004 Polaris MSX-110 or MSX-150 with the original oil tank you must order the complete kit, As the oil tank requires all the updated components to function correctly. The original tank is easily identified by its metal construction. Copyright © 2010-2015 WeberPower. All rights reserved.